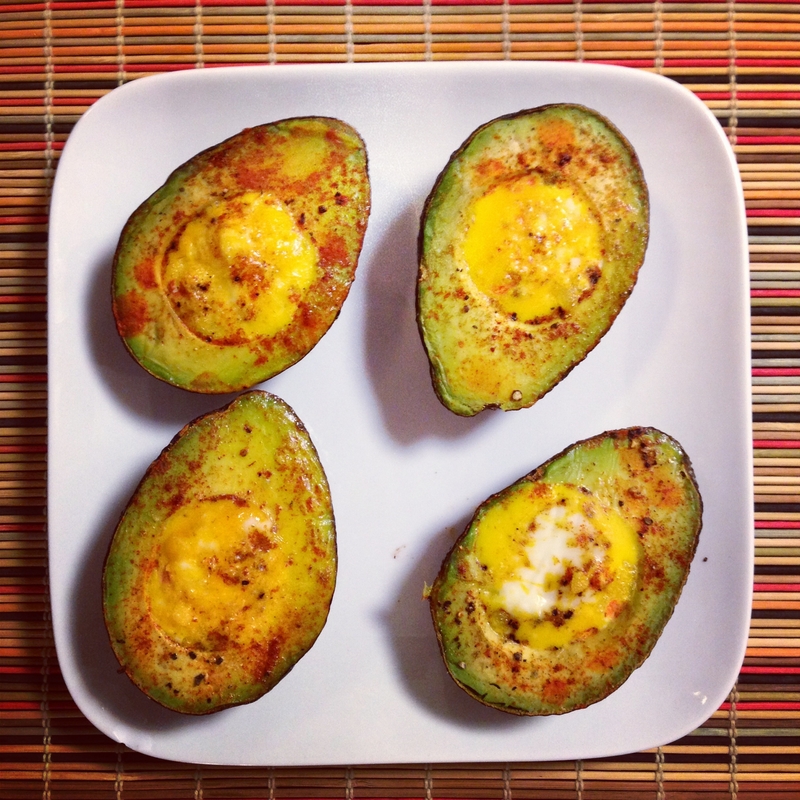 If you're an egg and/or avocado fiend, listen up. The Eggocado is a quick, explosively delicious way to throw a fresh twist on the monotonous, colorless egg creations youâ€™ve likely been whipping up for years. 1. Preheat the oven to 425Âº. Grab a sharp knife, cutting board, and a frying pan or baking tray. 2. Cut two avocados down the center into even halves. 3. Using a sharp knife, carefully de-pit both avocado halves. Chop the pit so that the knife digs in firmly. Hold the avocado half with one hand and twist the knife with the other â€” the pit should pop right out and leave the â€œbowlâ€ clean and intact. 4. Flip the halves over and trim off a thin slice from the bottom. Pretend that itâ€™s avocado carpaccio. Cutting off the bottom creates a flat edge and lets the avocados sit upright, that way all of the egg-y deliciousness wonâ€™t spill out. 5. Crack two eggs into a measuring cup and whip briskly until itâ€™s consistent. To your own taste, add a dashing of salt & pepper and a few squirts of Cholula, Frankâ€™s, Tabasco, Sriracha etc. directly into the egg mixture. 6. Place the avocado halves on a frying pan or baking tray, and pour the egg mixture evenly into each half. Itâ€™s okay â€” and encouraged â€” if the egg spills around the rim. 7. SPICE IT UP! Squirt on a little bit of fresh-squeezed lemon â€” thatâ€™s mainly to prevent oxidation and the avocados from getting brown â€” and then sprinkle the tops with salt and pepper, cumin, paprika, and a dusting of cayenne. 8. Pop the pan/tray in the oven for 18 minutes â€” it should be roughly the equivalent of a runny, sunny side up egg once itâ€™s done. Feel free to cook it longer if you like your eggs more well-done. 9. ENJOY PROFUSELY. Cayenne + cumin + paprika + hot sauce + S&P is just one possible combo. Like youâ€™d do with a loaded omelette or fried eggs â€” get creative and EXPERIMENT! Cheese, pico de gallo, salsa, and turkey bacon bits are just a few possible add-ons to infuse additional layers of flavor.